The negative externalities of fossil fuels and coal in particular are fairly obvious and range from its effects on individual health to climate change impacts. But here’s one I hadn’t thought of. Via Pedestrian Observations we learn that coal shipping slows down cargo and passenger rail service in three distinct ways. – First is the non-surprising fact that coals trains are large and slow. 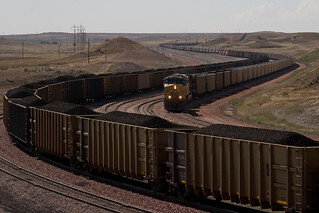 In order to be shipped profitably, coal trains tend to be larger than most freight trains and operate at slower speeds. Even though they may be limited to being on the rails to specific times of day, this still reduces the amount of time for faster freight and passenger service and reduces the speed that other trains can move at when the coal is on the track. – More obscurely, routes that carry coal must be laid out to handle these larger, slower trains. Specifically, turns cannot be banked as steeply. Banked turns allow a vehicle to negotiate a curve at a higher speed without risking the cargo shifting excessively or unnecessarily causing discomfort to passengers. Beyond the fact that freight is slower and needs a lower banking, extra heavy freight is at more risk from shifting loads causing a crash and so banking must be even lower. All of this slows down all trains no matter what their top speed is. – Finally there is just the damage to the rails that heavy loads cause to the tracks. Much as in the way that road damage goes up exponentially with the weight of the vehicle (so a 4 ton truck causes 4 times as much wear to a road as a 2 ton car), extremely heavy trains cause significantly more wear and tear than standard cargo and especially passenger trains. Poor track conditions force the fastest trains to be even slower again so this costs both time and higher maintenance costs. Now, most of these issues are just built in to the fact that in most places freight and passenger trains share tracks. A few less coal trains is not going to change that fundamental limitation to passenger rail in the US. But even minor improvements to the speed of standard freight has benefits, increasing its competitive edge over less efficient truck shipping, improving supply chains, etc. Fewer large, slow trains and tracks in better condition will benefit all other rail traffic. This will not be the straw that breaks the camel’s back on coal based power generation. But it is a good reminder of the many large and small ways that transitioning away from coal will benefit us in varied ways. Pedal-powered electrical generator. Illustration from The Human-Powered Home. Many people who have ever spent much time on a bike have considered the idea that the same system could be used to generate electricity. As far back as 1914, Popular Mechanics was writing articles about bikes adapted to generate power. Today, several companies offer kits that adapt or just connect to a bicycle that allow it to be used as a small scale generator. It would seem like the perfect convergence of efficiency, self-reliance, and simple solutions. Unfortunately, not so fast…Generating power by bike may not be such a great idea after all. The first issue is that humans really aren’t terribly strong. A healthy adult can put out about 100 watts of energy for a reasonable amount of time. That might drive a few light bulbs, but you’re not going to run an air conditioner or charge your new Nission Leaf with that. But if you’re going to ride to exercise anyway, why not capture that energy even if it’s just a small part of your daily usage? Well, because you may not be generating what you think you are. As we’ve looked at before, one of the real bugbears of generating any type of energy or work is loss in conversion. Every step you take to transform or convert energy from one type to another typically has a pretty big loss. Bike powered generators are no different. First of all, the human body is not a terribly efficient converter itself. We use food to power movement. Transforming the stored chemical energy in our diet to power movement already has huge losses. Once we do start pumping our legs though, we still have to power the bike, converting muscle based movement to mechanical rotation, that rotation then has drive a generator, and then finally, we typically have to store the electricity somehow to allow for future use. A recent article in Low Tech Magazine does some back of the envelope calculations and arrives at the conclusion that just looking at the losses that occur in the bike itself and the generator, roughly 2/3 of the energy you produce by pedalling is wasted. In looking at the energy and materials needed just to build the kit that converts your bike into a home generating station, the authors finds that you would be unlikely to ever even generate enough power to replace what was used to build the kit in the first place. Not so good. But this is not to say that there is no place for human powered work and specifically pedal power. The article’s author goes on to explore ways to solve the massive loss built into a bike converted to generation. His first point is that your typical bike is well designed to drive you around, not to spin a generator. Custom built pedal machines designed specifically to drive a generator can remove most of the major mechanical inefficiencies in a standard bicycle. But as we’ve seen, anytime you convert energy, you have losses, so he points to one of the best improvements, take the electricity completely out of the equation. Pedal Powered Machines work by using the pedalling force to directly drive work instead of generating electricity that is then used to perform work. Think of the foot powered sewing machine or potter’s wheel as two of the few versions of this technique that really survive today. Human powered machines go as far back as anitquity. But pedal powered machines really didn’t come into being until the 1870’s when the invention of the bicycle spurred other uses for the highly efficient foot powered design. (Ironically, it was only the arrival of the fossil fuel powered industrial age that allowed for more advanced steel manufacturing that made pedal powered machines possible.) The combination of using the most powerful muscles in the legs, with a compact design, with the ability to properly gear the movement made pedal power vastly superior to other human powered devices for most applications. The late 19th and early 20th centuries saw an explosion in pedal powered devices for home and industrial use that only died out as fossil fuels and electricity slowly became cheap and ubiquitous. Other than a few niche and novelty attempts to bring back pedal powered machines like the Fender Blender, not much has been made of the advantages of pedal powered machines in the industrialized world in recent times. But there are those for whom the unique combination of efficiency, low-cost/simple design, and freedom from industrial energy has real advantages. Groups like Maya Pedal and others have developed pedal powered machines that are cheap, effective, and perform critical work in a developing world environment. Most of these machines are designed for basic farming tasks, water pumping, light weight industrial or manufacturing work and the like. The combination of greatly amplifying the body’s strength without being dependent on unavailable, unreliable, or unsustainable power sources make these machines ideal solutions for the tasks at hand. So while mini devices to charge your iPod while you ride may be handy ways to harness your legs, think before you build that home generator system and instead look at making a pedal powered washing machine instead. Where’s all that “green” energy going to come from? On the left is a breakdown of how energy is produced. On the right (pink boxes) is a breakdown of how energy is used. On the far right, in grey, is a summary of the final outcome of the process. This is the first, and most, shocking aspect of this chart. “Energy Services” is basically energy that was used for some actual purpose like lighting your home, driving your car, building your widgets. “Rejected Energy” is waste. Energy that was not put to any productive end. More than half of all energy produced is wasted. Now, there is “waste” and there is “waste”. A lot of this is due to the nature of the way that energy is produced, distributed, and used. When electricity is transported by wires from the power plant to your house, some is lost (roughly 7%), and there isn’t a simple way to change that under our current electrical system. Back at the power plant, only about 1/3 of the energy in fossil fuels is captured as electricity, a figure that hasn’t really changed since the 50’s. Some of this is due to thermodynamics that make it difficult to transform and transport electricity and some is due to old, inefficient technology, sloppy design, and outright waste. But the end result is that only about 30% of energy used to produce electricity is used for any purpose. Even worse is petroleum used in transportation where less than 25% of inputs end up doing any actual work. Note that in this case, the figure actually hides a huge amount of waste depending on how you define “actual work”. If the purpose of burning gas in a car is to move around 1-2 tons of steel plus you and your stuff, this is your figure. If the purpose is to move you (provide mobility) the loss here is substantially higher. Many see great promise in the switch to electric cars. The Nissan Leaf is rated to get a gasoline equivalent of 99 mpg, roughly a 300% improvement over an equivalent gas powered vehicle. But consider that even at that level of efficiency, more than 2/3 of the electricity has already been wasted by the time it gets to your car’s battery (and before you account for moving around 3,500 lbs. of steel, glass, etc.) While an impressive improvement compared to currently technology, I think this best serves to illustrate just how inefficient current technology is. Another big picture question is about the relative efficiency of end use types. Residential, commercial, and industrial users all waste around 20% of their energy inputs. Transportation by contrast wastes about 75%. I suspect there are numerous reasons for this difference. One is that energy transformation by burning tends to be wasteful. With electricity, that transformational loss has already happened upstream. With gasoline, it is typically happening in your car’s engine, which is not well equipped to transform energy efficiently. In overview, there’s two pretty obvious areas where it might make sense to focus our efforts. The two main areas of loss are at the generation of electricity and at the generation of movement with gasoline. These two areas have a feature in common, there are actually multiple transformations going on; fuel is burned to create heat, heat is used to create movement (kinetic energy), and for electricity the kinetic energy is used to generate watts. Each step loses a large portion of the input’s energy, typically as heat. A big factor in most power plant designs (of all types) is water supply for cooling. These are factories designed specifically to generate heat, and yet they go to great pains to have a system to cool themselves down. Cogeneration plants are a more advanced design to directly address this waste. Instead of excess heat being a waste product, it is distributed to be used directly as heat in homes and/or businesses. This saves this lost energy and avoids yet another transformation where some fuel would be turned into heat at the final location. But the limitation is distance. It is hard to move heat over any significant distance and so this only works where power plants can be located in the vicinity of home and businesses. Now one way to avoid heat based loss completely is to generate electricity in a way that has none, solar and wind. Follow the little yellow line from “Solar” on the left and notice how it goes directly to the end user, skipping the entire Electricity Generation step that loses so much energy. Of course, it’s a bit hard to follow that line because it is so little. For how much you hear about it, it is somewhat shocking to see how little energy Solar and other renewables currently supply. But its important to remember two things. First is that solar is really in its infancy and it is growing fast. The fact that it’s a negligible part of current production doesn’t mean that that can’t change quickly. Second, remember that a kilowatt of solar is not the same as a kilowatt of coal generated electricity. Bypassing the wasteful multistep conversion process means that every unit of electricity generated from the sun replaces roughly three times that much of equivalent energy in inputs. A little bit goes a long way. Next, the chart reveals why a general movement away from centrally produced energy to distributed production may make sense. As efficient as solar is, it still loses that 7% transmission cost when it has to go over long distances. If that solar cell sits on your roof, you’re instantly 7% more efficient that a centralized power plant using the same solar cell technology. Similarly with cogeneration plants, it may make sense to start putting energy production closer to its end user. In the past, the efficiency of scale of producing power in a central location outweighed this factor. In the future, perhaps the efficiencies of scale will shift to producing small but advanced power generation systems so every home can have the latest technology in solar, fuel cell, or other power generation systems. A final point that comes up for me from this chart is just how well it illustrates why reducing energy consumption is so important, and perhaps more important than using it more efficiently or generating it more sustainably. In terms of bang for your buck, it makes more sense to insulate your home, change your lightbulbs, and drive your car less than it does to buy a more efficient furnace, put a solar panel on your roof, or buy an electric car. This chart illustrates perfectly why. End use efficiency matters, but you’re still fighting all the loss that’s happened before that energy even gets to you. Every watt or gallon you don’t burn never has to make that journey at all. Transforming our energy infrastructure to one that is moderately sustainable is a massive undertaking and we don’t have a lot of time. For now, the fastest and most cost effective way to reduce emissions is simply to use less energy. This not only buys us more time to switch over our generation to better forms, but also frees up funds to be invested in more productive uses than sending them them up a smokestack. Since waste heat is typically the single biggest energy waster in fuel burning processes, it somewhat begs the question of why more isn’t already being done to tap this. The article blames regulatory issues surrounding electricity generation and general ignorance/inattention to the potential by industry. The government does not currently recognize waste heat recovery as “renewable” energy which would open up the industry to a number of incentives and advantages that could help it grow. The biggest technical hurdle seems to be that most of these heat sources run cooler than is needed for traditional electricity producing turbines. But it appears that progress is being made using lower boiling point materials than water for the turbines and in scaling down the units to suit medium scale operations. Defining this process as “renewable” energy seems a bit of a logical stretch. On a engineering level, this is about improving the energy transformation efficiency of an industrial process. If I get an extra 10% of energy from burning coal, how is that 10% renewable? It may be that providing some incentives to spur development and growth in this industry is a good idea. But I think the fact that those would be needed simply points again to the fact that energy is in general, under priced. Fully rational pricing of energy that includes internalities and externalities would make this waste heat valuable enough that companies would be lining up to use it without prodding. Regardless, it does help to clarify the point that making fairly simple improvements to our current energy system may be the quickest and most cost effective way to bring down our usage and emissions in the short term. Knox News (via Market Urbanism) reports that the US has roughly 1 billion parking spots. That’s nearly 3 for every car on the road and adds up to roughly 4,000 square miles of total area (a tad less than the total area of Connecticut). In the US, the average price for land is $1000 per acre. That equals $640,000 per sq mi. That means we have land worth roughly $2.5 billion assigned to parking. And since parking tends to exist in more valuable areas, that figure is likely massively understated. No specific point here. But wow. David Leonhardt makes a quick summary point in his article about the history of opposition to America’s social safety net that I think is far more broad than just the issue of the recent health care law. He is discussing the competing strains in American culture and history of upholding individual freedom and up-by-your-bootstraps risk taking with our belief in social justice and the sense that all deserve to share in America’s prosperity and success. It’s easy to look at the current debate and see an unavoidable trade-off between this country’s two economic traditions — risk-taking and security. But I don’t think that’s quite right….Guaranteeing people a decent retirement and decent health care does more than smooth out the rough edges of capitalism. Those guarantees give people the freedom to take risks. A good part of the United States’ success is built on our tendency for creativity, risk taking, entrepreneurship, and innovation. While the “solitary genius in his garage” meme can be overplayed, it is true that if you look at a lot of the big breakthrough companies (Google, FedEx, etc.) in recent history you’ll find someone who struck out on her own, bucked conventional wisdom, and took a risk to create something new. A common conservative argument is that increased government involvement in people’s lives will coddle them, make them dependent/passive, and will stifle innovation and risk taking. While there are those that will take risks no matter the cost and those who value comfort and security above all else, most balance risk and reward, potential benefits and potential costs. This fits neatly into Maslow’s hierarchy of needs. In this paradigm, the classic ‘American Innovator’ is working in the realm of self-actualization, pursuing the goals of creativity and achievement. But Maslow’s big realization was that most people will only pursue these higher goals once their more basic needs are secured (food, water, safety). Here is Leonhardt’s critical point, safety nets don’t prevent people taking risk, they encourage them. The knowledge that our most basic needs for survival are secure (resources when we can no longer work for ourselves, care if we become ill) gives us the freedom to strike out on our own and take the leaps that do sometimes result in breakthroughs and have helped the United States to be a leader in technology, business, the arts, and justice. …it’s worth taking the safety net metaphor seriously. Typically when you see a safety net in place, you’re not really looking at someone who’s trying to be safe. You’re looking at someone who’s trying to do something dangerous. Because it’s dangerous, there’s a safety net in place. But the main point of the net is to facilitate risky-taking behavior not to make you safer than the average person. One perhaps less universal, but still perceptive contention is bikesnobNYC’s maxim that “brakes make you faster”. A lot of classic environmental concerns get wrapped up in moral judgments. We need to “save” the Earth, “protect” polar bears, fight against “threats” to our wild lands. While I may believe in all those causes, not all do. Perhaps worse, even some who might agree with the goals of these campaigns are turned off by the common perceptions of environmental activism as elitist, anti-human, or just a distraction from more important issues. While I’m a proud “environmentalist” and don’t think we should apologize for our goals, there’s a lot of wisdom in speaking to people in ways that resonate with them. Even more importantly, a lot of environmental goals are worth pursuing purely on measures that environmentalists typically (or it is claimed) don’t pay attention to like jobs, national security, economic considerations, and the like. The case for responding to climate change is so broad that even the Washington Post ran a recent editorial arguing that “fighting global warming should be a conservative cause“. Writer Bracken Hendricks makes a strong case for addressing climate change on the basis of protecting our “national interests”, “rigorous cost-benefit analysis”, and to avoid “unnecessary intrusions into our personal liberty.” One of his key arguments is that regardless of your belief in the science of climate change, we should behave like that key idol of conservatives, the small business owner. This approach to arguing for addressing what is typical viewed as an “environmental concern” as a rational response to a threat to our economic and national security interests is why I so like David Roberts’ recent campaign to rename people who want to address climate change issues. His general point is that as long as the movement to address climate change is seen a issue of the environmental lobby, it will be subject to all the vagaries of the left/right debate in this country. In reality, there is a huge, natural coalition of people on both sides of that split that should see this as a critical issue. Roberts sought to come up with a terms to describe those who see this as a threat to be addressed and settled on “Climate Hawks”. So I’m officially declaring myself a Climate Hawk and hoping that is just one of a growing number of ways in which issues that have typically been seen as the purview only of people who “care about the environment” or “social justice” find natural allies among groups who have been considered adversaries. The Wall Street Journal had a recent article (via Market Urbanism) on how recent cuts to public transit in NYC had affected real estate sales in several neighborhoods. One real estate agent describes trouble selling properties that were served by a long running express bus route which was recently cancelled. Anecdotes aren’t data of course. But it’s not a stretch to say that you could probably assign a rough number value to proximity to transit in New York. If $80,000 is the market value of that particular transit service for a single unit, imagine how much “value” was destroyed in that neighborhood by the loss of a bus. While numbers like this are so general as to be of questionable accuracy, they do point to a welcome trend. Increasingly it seems that people are making the connection that sustainability and environmental considerations are not just little adjustments you make after you’ve set up your life the way you want it. But that our life choices like where we live have big, direct impacts not just on our environmental impacts but also on how expensive our lives are. Transportation costs are notoriously difficult for the average person to estimate. The main reason may be that transport costs are an odd mix of small daily incremental costs (gas, car wash), larger annual costs (registration, insurance), and large unpredictable costs (repair, maintenance). This mix tends to lead to people underestimating what they actually spend on transportation which can have a large impact on the choices they make. Meanwhile, Los Angeles Metro’s in-house blog The Source, wades into the debate on how well people estimate their own transportation costs. They don’t reach any conclusions beyond noting the confusion between daily incremental costs and overall costs and point out that transit users estimate their costs lower on average. I noticed though that taking a rough average of their poll respondents’ numbers gives an estimate of less than $200/month in transportation expenses. By contrast the Abogo estimate I got for the region is $719/month, nearly four times more than The Source’s readers self-estimate. Looks like there is still room for improving people’s awareness of their lifestyle’s costs. Over at the TreePeople blog, founder Andy Lipkis takes exception to water agencies’ typical reliance on technological/industrial approaches to providing safe, reliable water supplies. He compares two possible approaches for increasing the local supply of water for Los Angeles, rain water capture and ocean water desalination plants. Beyond the obvious question of why you would allow rain water to run into the ocean, becoming salt water, so you can then pump it back out and try to take the salt out of it, he sees another lost opportunity with this approach, jobs. The investment decision towards massive grey technology and away from people drains cash and resources, jobs and vital energy from communities and city. The result is a very powerful contributor to chronic unemployment of urban dwellers. Lack of legitimate, useful work perpetuates poverty, hopelessness, crime, and leads to youth violence. A general shift away from labor intensive and toward capital intensive approaches is considered normal for an advanced economy with high living standards. Labor tends to be expensive and it is more “efficient” to invest in larger, more automated systems. Lipkis has identified one undesirable consequence of this tendency. But he doesn’t go beyond that into one of the key reasons that this is typical…cheap energy. Seawater desalination is hugely energy intensive. That this is now being considered as a viable solution to dwindling fresh water supplies points to our desperate need for more water, but also that manufactured energy is still vastly cheaper than human energy (labor). Even a modest increase in the costs of energy will begin to shift this equation, making energy intensive approaches more costly while making labor intensive approaches more competitive. Whether it is through cap and trade, industry specific emissions targets, or other techniques, all recent proposals to change our energy policies have been widely attacked as “job killers”. While anything that increases costs does tend to suppress economic activity and jobs in the short term, most critics fail to see the long term implications of raising energy prices. For many industries, long term expensive energy may actually tend to increase employment as labor becomes more competitive cost wise compared to capital intensive techniques. By keeping labor relatively expensive, we’ve driven our economy toward cheaper, energy intensive systems. While this may have lowered the cost of many goods and services, it has also contributed to job insecurity, higher unemployment, and rising outsourcing. Corporate america might not like expensive energy, but if you actually “work for a living”, it might be the best thing coming. At a recent talk in Los Angeles, New York City DOT Commissioner Janette Sadik-Kahn made the following seemingly innocuous statement, “no one can claim the current system isn’t broken.” It was an offhand thought that got general murmurs of agreement. But in some ways, I think this may be the most radical thing she said all night. Ironically, it may also be one of the least accurate things she said. Sadik-Khan is famous (and infamous) for rapidly and shockingly veering NYC transportation priorities away from the standard “move the most cars as fast as possible” mission statement to one that at least considers pedestrians, bicyclists, and transit priorities and their needs. Without overstating her impact, it does seem that starting from this fundamental belief that the current system does not function has allowed her and her department to embark on a series of experimental approaches. Departments of Transportation are notoriously hidebound and resistant to change. Many planning concepts and priorities are still based on approaches developed in the 1950’s and earlier. Indoctrination into these traditions is passed on as new engineers study under the last generation and then begin to work in the real world. So rather than nod in agreement, let’s take her statement at face value. Is the current system broken and can anyone claim that it’s not? I doubt anyone would argue that our current transport system is ideal, at least no one who commutes in any moderately sized city would. But “broken” is a distinction of kind and not degree. Like the apocryphal boiling frog placed in a slowly warming pot of water, people have an amazing capacity to adapt to slow changes over time without noticing, each new level of degrading conditions becomes the new “normal” that is accepted as the way things are. Between 30,000 and 40,000 people per year are killed in traffic accidents in the US. Your chance of getting killed in an auto accident is roughly 1 in 87. The chance of being killed by terrorism…1 in 9.3 million. But which is seen as an existential threat to our country? In 2007, the overall cost of traffic congestion is estimated at $8.7 billion, $750 for every traveler and wasted time added up to 4.2 billion hours, roughly one full work week per traveler. Over the last decade, we have added an average of 32,000 lane-miles per year to the nation’s highway system. Despite the huge social costs and big investments, traffic congestion has gotten worse, nearly continuously. The only event that seems to have decreased it in recent history was the intense economic slowdown of the last two years, and there are signs the economy (and traffic) are on the rebound. Does all this mean our transportation is “broken”? Hard to say perhaps. People enjoy greater mobility than they ever have in the past, cars are improving rapidly; becoming safer and less polluting. But will incremental improvements fundamentally change anything? Beyond easy statistics, some of the biggest criticisms of auto-centric planning are of the costs in terms of community and quality of life. These criteria are tough to quantify on even the broadest criteria. Perhaps all that can be said is that there is a rapidly spreading belief that the system is broken. It is that belief that there is a better way that is forcing change in cities, large and small, around the country. To the initial assertion that “no one can claim…” Well, here I will have to take exception with Sadik-Khan as much as I wish I could agree with her. I won’t bother to link to the wide range of voices, from the marginal to the powerful, who would do anything other than admit that our system is broken. Even those who will admit that there are problems will usually assign the cause as being a lack of commitment to an auto-centric policy rather than an over commitment to it. While I can’t agree with Sadik-Khan in a literal sense, I will stand with her vision without reservation. Change often requires both the belief that change is itself possible and that it is necessary. I think she is demonstrating the power of one’s basic assumptions and why they are so critical.